The morality of an apocalypse dictates that it can happen only once. Our main characters in David Atkinson’s newest book, Apocalypse All the Time, argue this semantic point to a level of necessity and then live in its tumult. There’s an apocalypse for all the natural disasters one could think of, as well as plenty of anomalies in apocalypse form: locusts show up to be overwhelmingly locust-like, the moon parks itself in front of the moon and fucks up the weather, stairs to a golden city show up and all the Jews start walking up them. The Apocalypse Amelioration Agency sorts out the different apocalypses and, thus, the world itself. Between them and Marshall, our eyes and ears for end after end after end, we get the power and compliance that propel the book. The narrative structure doesn’t necessarily pit them against one another, but with every apocalypse, the AAA and Marshall rub up together more and more abrasively. Popping the door open didn’t change much. It was still dark. The hallway had no windows. Marshall didn’t know if it was day or night. Still, the hallway was empty so it was easy to crawl along on the carpet, easy to find the exit to the familiar emergency exit stairs, and easy to follow the guide rail down to get outside. Easy. This was a normal day with minor inconveniences. In many ways, the presentation perfectly reflects the chaos. Everything is broken up, if not broken: short chapters, multiple parts, interludes, and, within all those, a ramble that jumps from one piece of situational absurdity to another. 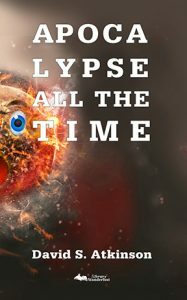 At its best, Apocalypse All the Time puts onto the page all the never-ending tangents that a continual series of earth-ending events would cause. But, at its worst, Apocalypse All the Time has a real roundabout way of getting to the goddamn point sometimes. I see Pynchon’s fondness for unrelated avenues and Vonnegut’s tendency to spend most of a book ruminating, and while those are respectable literary touchstones, I just want the whole thing to be a bit tighter when mixed in with Atkinson’s own style, his bizarro inclinations filtered through the lens of straight up observational fiction. The sum of the book’s brief 180 pages has the feel of a novel more than a novella. Its length is at the uppermost part of that gray area where it might be worth discussing what to call it, but I really wanted to see it go down instead of up in terms of page-count. When reading, I saw tiny cuts to be done in almost every paragraph: action to be streamlined, more points and less viewing in the POV. With the exception of the interludes—narrated by one of the mouthpieces for the AAA—that I thought stroked the gimmick of the book a bit too hard, there was great and necessary material in every section. I also fear that too much cutting would, unfortunately, leave us without many of the wonderfully meta aspects of the form. However, if Marshall is walking around looking at stuff and I’m done looking at it before he is, it’s either time to make the style more stylized or trim up at a sentence level. Atkinson’s writing is at its best when he breaks it down into scene. Marshall and Bonnie, Marshall’s more alpha-minded companion who he meets while going through the doldrums of yet another apocalypse, are on point when they banter and scheme and, occasionally, find each other the perfect place for a dump of plot-related information. They’re united mostly by their desires outside of one another, and good on Atkinson for not coasting off what could be easy thrust from a relationship thread. Their chemistry is one of the most appealing aspects of the book. Aside from the friction of the AAA and Marshall, it’s also one of the better propelling devices for the narrative as a whole. Despite some clashes between the straightforwardness of the narrative and the absurdity of the overall conceit, Atkinson dances between the two quite gracefully. At the moments when he makes the explosion meet the philosophy, it becomes a clearly wrought story about perception and determination. Even through the dissonance I see the parallels with the form: not one thing, not the other. 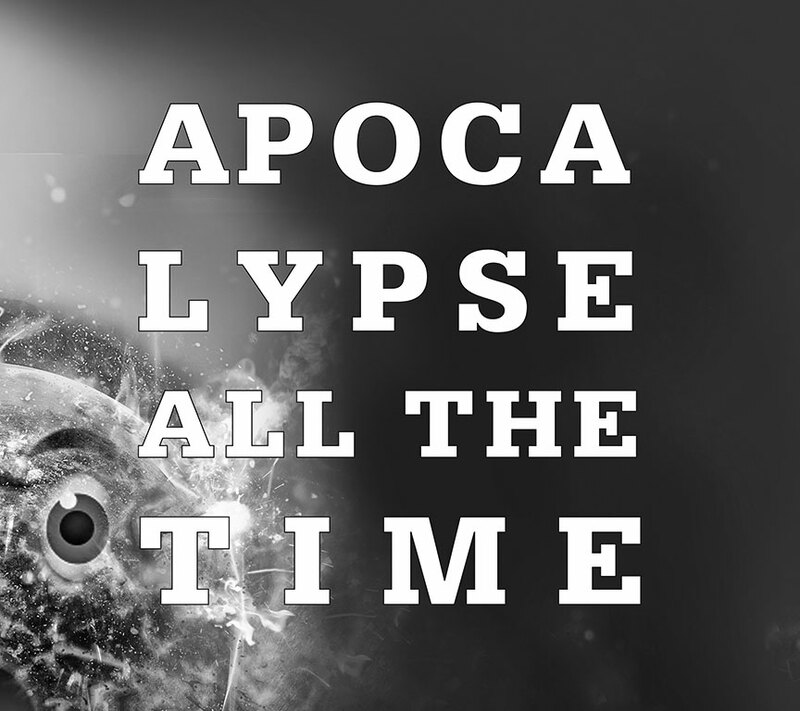 Within Apocalypse All the Time is a solid, enjoyable story. There’s perhaps too much of it, but Atkinson’s creative form and cinematic dialogue make this a fun journey for anyone willing to take the ride through all of its twists and digressions. When it’s over, perhaps you’ll wonder if anything is ever truly over. 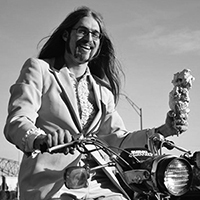 Ryan Werner is a cook at a preschool in the Midwest. He plays an old Ampeg VT-22 in a loud, instrumental rock band called Young Indian. He’s online at RyanWernerWritesStuff.com and @YeahWerner on Instagram.